Square, one of the most recognizable names in the point of sale (POS) industry, provides shop owners and freelancers with a variety of tools to begin accepting credit card payments. Customers can choose between digital and printed receipts —and business owners can update pricing and inventory in real time with the Square Point of Sale system. For organizations in the hospitality sector, suggested tip options at checkout provide a convenient way for customers to calculate gratuities. 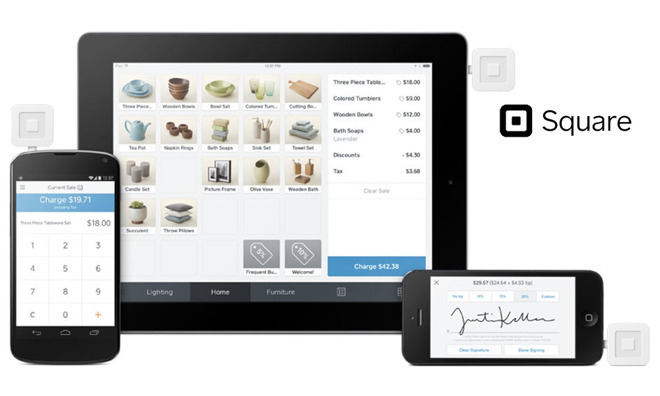 Square also lets shoppers split a tab and use multiple payment methods. The all-in-one service is compatible with Apple and Android devices, as well, allowing businesses to use it as a mobile POS or via a tablet in brick and mortar environments. Money is deposited in your account in one to two business days. Beyond those features comes the cost of processing transactions. Current Square rates are 2.75 percent per swipe, dip, or tap, and 3.5 percent plus 15 cents per keyed-in transaction. Square for Retail, which is designed specifically for brick and mortar retailers, lets cashiers ring up items in seconds and create customer profiles for $60 per month and 2.75 percent per swipe, dip, or tap. With the Square Stand, which retails for $169 and includes a Square Reader and dock, businesses can process credit cards right out of the box. Those looking for the simplest setup can obtain a Square magstripe reader for free (additional readers will run you $7.99 at Amazon); however, the device connects via a headphone jack. For iPhone 7 and 8 users, the Lightning Adapter for Square Reader is available for $15, while the Square Contactless + Chip Reader, which works with Apple Pay and Android Pay, can be purchased for $43.98 at Amazon, a discount of $6 off MSRP. Like Square, PayPal Here has a mobile card reader, which lets small businesses accept face-to-face payments using credit and debit magnetic stripe cards. The reader itself is free for new customers, but each additional card reader is $14.99 through PayPal or $17.27 from Amazon. 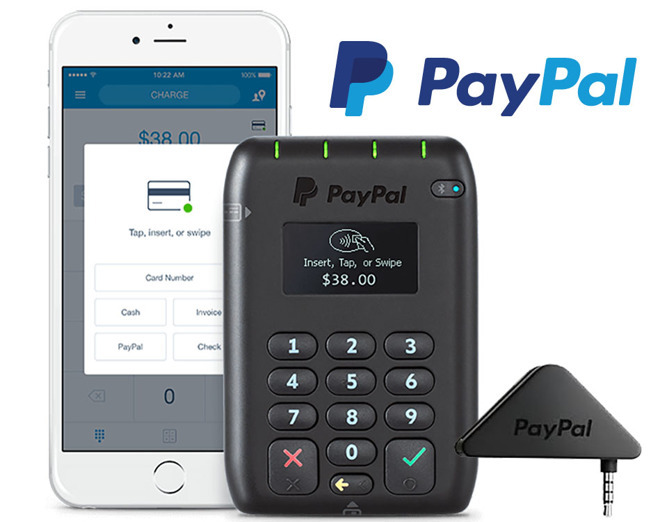 The PayPal Mobile Card Reader also plugs into the audio jack of your phone or tablet, so iPhone 7 and 8 users will want to opt for the Chip Card Reader, which connects wirelessly via Bluetooth to the PayPal Here app. It also allows business owners to accept payments with chip cards for added security, as well as Apple Pay. The Chip Reader can be ordered directly from PayPal for $79.00. Outside of the cost of physical equipment, PayPal Here's rates are slightly lower than Square at 2.7 percent per U.S. card swipe. Keyed-in transactions will set you back 3.5 percent plus 15 cents, while invoices are charged 2.9 percent plus 30 cents. Cross-border transfers are billed at 1.5 percent. Other than that, there are no setup or monthly fees and no processing minimums. Transferring funds from your PayPal account to your bank account can be done within the app; however, transfers do typically take three to five business days to be available for withdrawal, which is longer than Square's one to two day wait. PayPal Debit MasterCard users can instantly access funds, however. Intuit's QuickBooks Desktop Payments features two plans for swiped card transactions. The Pay As You Go option has no monthly fee, but transaction rates are higher at 2.4 percent plus 30 cents per swiped card. Users can also pay $20 per month to bring the rate down to 1.6 percent plus 30 cents per swiped transaction. Invoiced card payments vary slightly between the two plans by 0.2 percent with the $20 per month plan coming in at 3.3 percent plus 30 cents per processed charge. Same goes for keyed card transactions. The pay as you go plan charges 3.5 percent plus 30 cents per keyed transaction, while the $20 per month plan costs 3.3 percent plus 30 cents per charge. The benefit is easy accounting, as QuickBooks Payments syncs with your QuickBooks accounting software each time you are paid. The mobile card reader itself, though, costs $30.00 through Intuit. Like Square and PayPal Here, there are no termination, setup, or monthly fees. Those who charge more than $7,500 per month may qualify for lower rates upon speaking with a QuickBooks Payments representative. The lowest flat swipe rate belongs to EMSplus. At 2.25 percent per swiped card transaction, this is 0.45 to 0.5 percent cheaper than Square, PayPal Here and QuickBooks Payments. Like its competitors, EMS also offers users a free mobile card reader that connects to your phone or tablet via the audio jack (iPhone 7 and 8 users can purchase the EMSplus Lightning Swiper for $59.00 to connect the reader via the Lightning port). 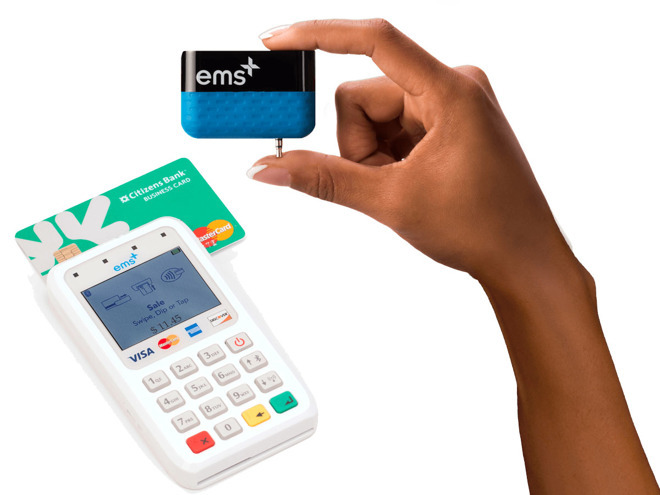 To accept Apple Pay, NFC and EMV chip cards, EMSplus' all-in-one reader is available for $149.00, although Electronic Merchant Systems is offering users a $100 mail-in rebate if you process at least $3,000 in transactions through your EMSplus merchant account within three months of purchase. The corresponding app is Level 1 PCI compliant for added security and works with Apple and Android devices. Star Micronics TSP143IIU Thermal Receipt Printer for $180.78 @ Amazon !
! No interest if paid in full within 6 months with the Amazon.com Store Card.